This is the biggest RezFest ever and everything points to this being the most exciting industry of our time! 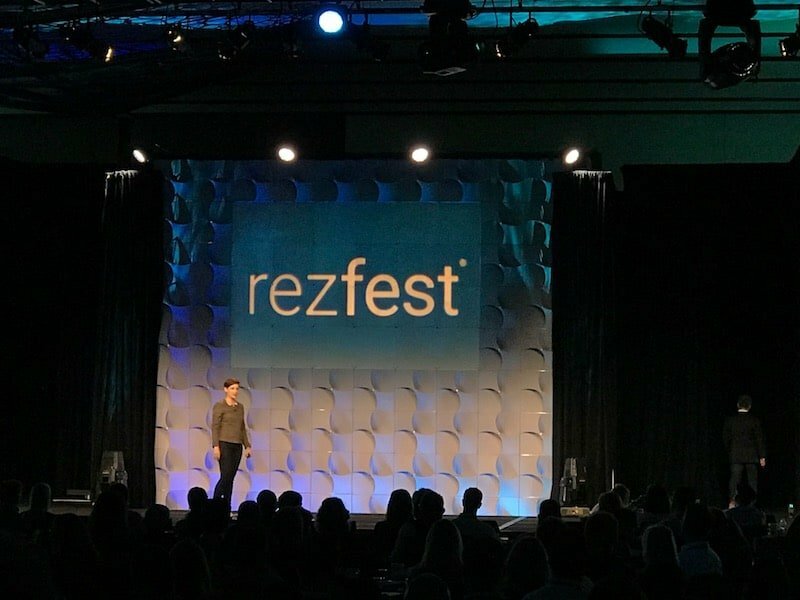 Tina Weyand HomeAway’s CPO took to the stage at Rezfest 2018 to talk to a packed audience about how we have the best opportunity to shift people from screen-time to real face time opportunities and how HomeAway want to be your innovation tech partner. Tech is reshaping our future and our world and its amazing to hear that HomeAway is embracing that. What was once fiction is now fact, and that window is shrinking rapidly. Kids today don’t know what it is like not to have wifi, smartphones, smartwatches, etc. and Tina explained how engaging in a virtual world will be commonplace. Tina started with Visualization and explained how we’re always struggling to make better decisions. The concept of zooming in for detailed info yet zooming out for better overviews are key practices to making good decisions. Tech is coming to the market to help us do these things better. A fascinating example of how zooming in helps is the way scientists can now capture DNA replicating on film. In school, we were only ever shown graphical representations of this where it was deemed to be logical and regulated. However the real footage shows randomness and unexplainable items allowing us to change how we teach these kinds of processes. For the example of zooming out, Tina shared some drone footage that provides a perspective of the environment we could never have seen before. Gorgeous whale footage on screen gave us another way to see our world that we just couldn’t have had a few short years ago. Obviously, this applies to things like checking for roof damage or search and rescue missions, and is a great example of how zooming out gives us context as to why something is happening. HomeAway has been focussing a lot on data visualization. Time and research have been spent to make search and discovery better on small screens. Using the HomeAway app, users can now paint an area of the map with their finger and see the properties in that area, changing the way travelers interact and choose their travel options. 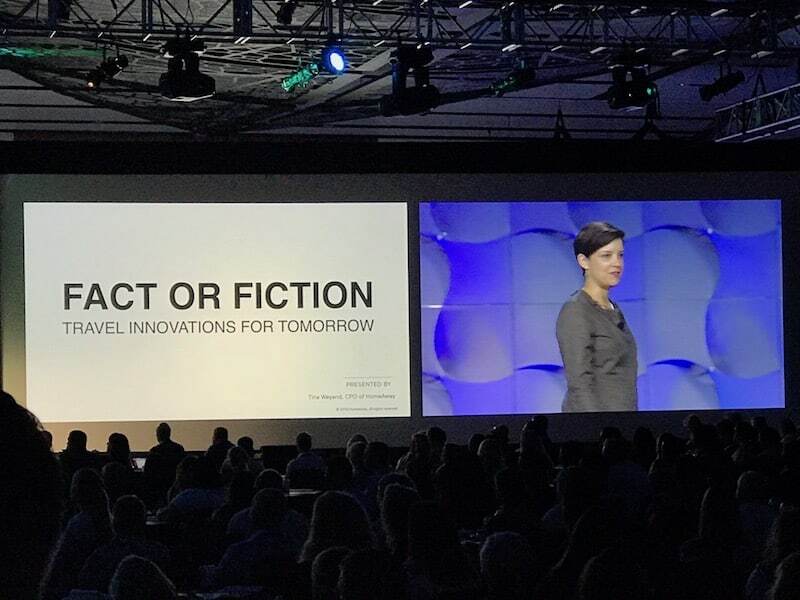 Also, HomeAway is working on ways to understand the ‘why’ and ‘how’ of travel. For example, traveling with the elderly or with disabilities greatly impacts a travelers decision on where to stay. By utilizing drone footage of a vacation rental property, a traveler now has a better understanding of how a property will serve their needs allowing for fewer hurdles in the booking process and more bookings overall. Indeed Virtual Reality (or Augmented Reality) are major innovations for the industry. 1 billion people will be regularly interacting with VR/AR by 2020 and this is a great way to see a property in its best light. Virtual Reality tours are better than photos, so these are not just a competitive advantage but a new necessity for your property. Interacting with the property in advance will be key to decision making. Not only does this save you time and money, travelers know what to expect and will be delighted when they arrive. HomeAway is strategically investing in that platform and thus in creating the best traveler experience. Arrival Assistant – this tool will make sure your guest can get there and get in. We speak from experience when we say the most stressful time of a vacation is the travel day. The fact HomeAway are innovating here is amazing. With contextual explanations of how to get to the property, where to find the keys or lockbox access. this is going to really improve this part of travel. The Arrival Assistant will use AI to provide answers or connect the traveler with an agent. Seriously helpful improvements! Underpinning everything is all the dataz. Did you know that 90% of the data in the world has been created in the last 2 years. Data is critical to finding the perfect match and fuels HomeAways’s new Trip Boards. Trip Boards allow travelers to find properties they like, bookmark them, and invite the rest of their party to start communicating and collaborating around decision making. 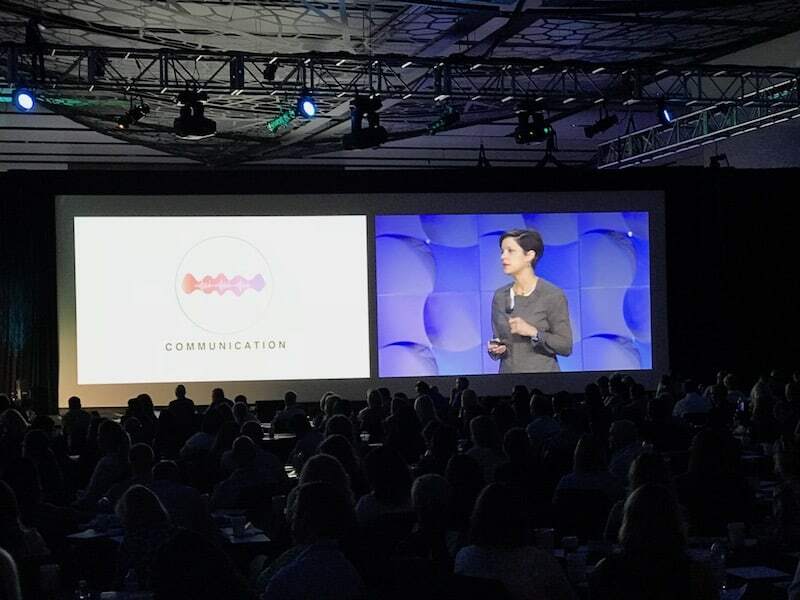 HomeAway is taking these conversations and turning it back into insights for hosts. The opportunities for hosts are surfaced so they can better capture potential leads. As a reminder, last year HomeAway introduced the Market Maker – a tool readily available- which is built off the data from the marketplace. For those who don’t know, they capture billions of computations every day, which can be used to improve revenue management as well as provide insights to understand demand. Homeaway really have your back in helping to make decisions. When you put this in context, 600/700 million Expedia users looking for flights, events, even hotels, give HomeAway a distinct competitive edge over the other OTA platforms. As the largest traveler platform in the world, HomeAway is in a unique position to understand travelers needs, desires, and their preferences. A significant amount of investment has gone into capturing the signals and insights of travelers to give you access to the data not available anywhere else. How does this help you as a vacation rental owner? This data can help you be more competitive, get more bookings, reduce your costs, delight travelers while growing your business. Game changers. To find out how YourWelcome can give you even more insight and allow you the chance to upsell items to your guests both before arrival and during stay, just come and visit our booth (#45) for a chat with one of our team.